- A dark year. In April, the military government decrees the end of direct elections for mayor in 68 cities deemed crucial to “national security”, including the state capitals. 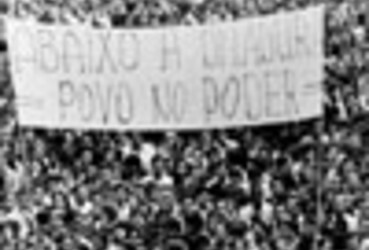 - The student Edson Luís de Lima is killed as students confront the police in Rio de Janeiro, months afterwards setting off the “Passeata dos Cem Mil” (The March of the 100,000). - In October, the student José Guimarães is killed in a confrontation between students of the Philosophy Faculty at USP (University of São Paulo) and those of Mackenzie University, in the center of São Paulo. - In November, the Brazilian government creates the Conselho Superior de Censura (Superior Board of Censorship) and on December 13th announces on national TV and radio the promulgation of Institutional Act No. 5 and of Complementary Act No. 38, which decree the suspension of the National Congress. The government now has absolute power over the nation. With the suspension, the Executive has the authority to legislate, suspend the political rights of any citizen and strip deputies of their mandates.